I've been on a pumpkin kick lately. Pumpkin may be like holiday music before Christmas. By the time you hit Thanksgiving, you're sick of it. Although, I'm not quite convinced that I will be. I don't see an end to this obsession any time soon! Between making three separate batches of pumpkin butter (here and here), eating pumpkin oatmeal, drinking pumpkin spice lattes at Starbucks, and even adding some pumpkin pie spice to my homemade granola bars, I'm still anxiously scouting out pumpkin-inspired recipes. 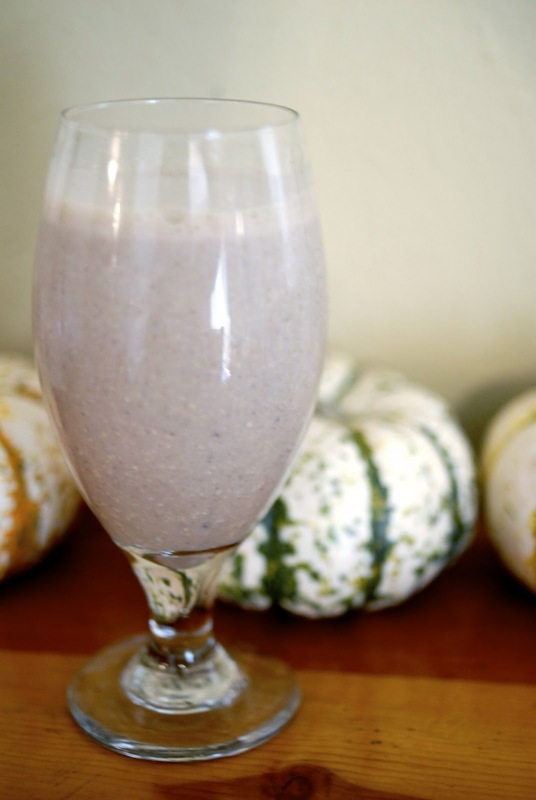 You can imagine how long it took me to find my blender when I saw this recipe on Oh She Glows. If you don't have a vivid imaginagion, I'll tell you. I did tweek the recipe a bit and I love it. In fact, I have it for breakfast. I slurp it up for a snack. And I've even made it for dessert (not all in one day...I'm not that bad!). Josh thinks I'm mad. I just think it's a better addiction than soap operas or margaritas! I am going to try this, maybe even today! Where do you get pumpkin butter? YUM!! Did you see my mom's pumpkin cookie recipe I posted? Might be right up your alley!